Let me tell you guys a little story. 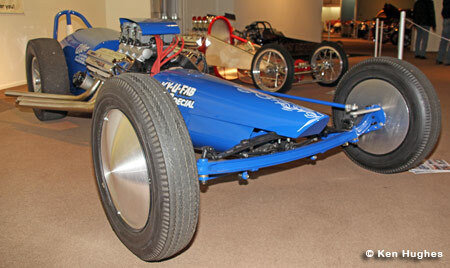 Back in about 1956, a guy moved from Oklahoma to the LA area and brought with him a dragster chassis he had built. Shortly after arriving here he met another guy who was a service manager at a Cadillac dealership. That guy had a race car engine from another car sponsored by the dealership. 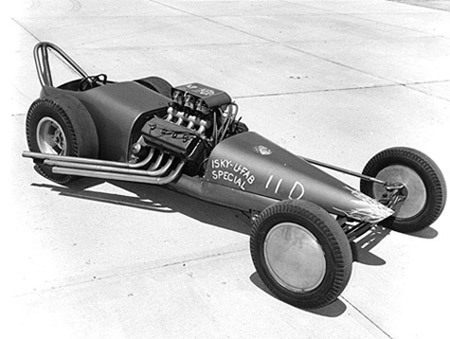 The pair put the Cadillac engine in the dragster chassis, put the dealership name on it and got a local lad to drive it. They won a big race with the car and that got the attention of a pair of racers from San Diego. 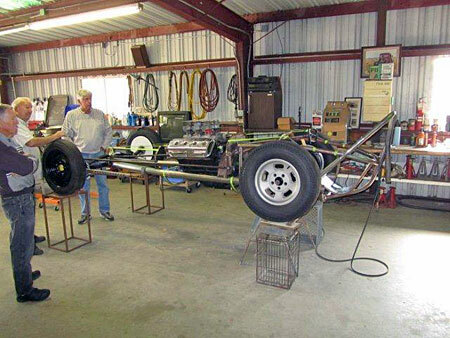 The San Diego guys came to LA and one of them, a body shop owner, (the other was an amateur race car driver), bought the chassis from the former Oklahoman who sold it to get seed money for a chassis business he wanted to start. 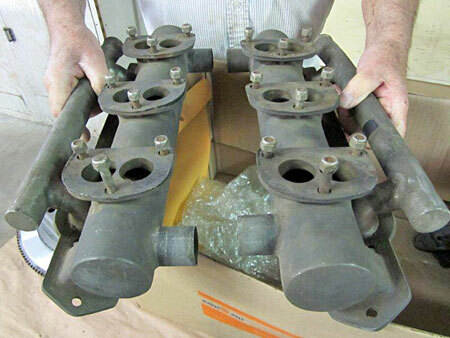 331 Chrysler engine from his brother-in-law. They raced the car with some success, at Paradise Mesa and also at some LA area tracks like Lions. 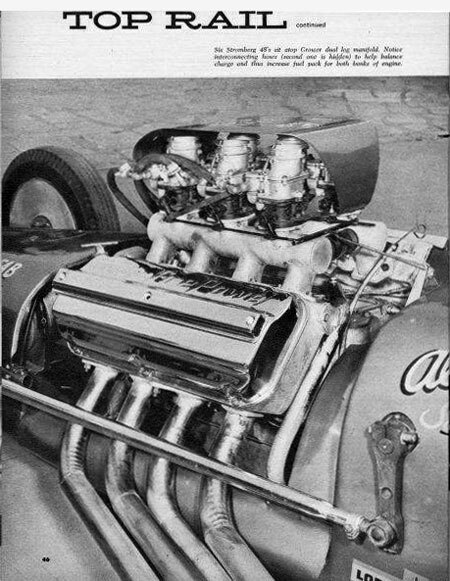 Late in 1956 yet another San Diego racer built a 354 Chrysler for them and put one of his new log intake manifolds on it. 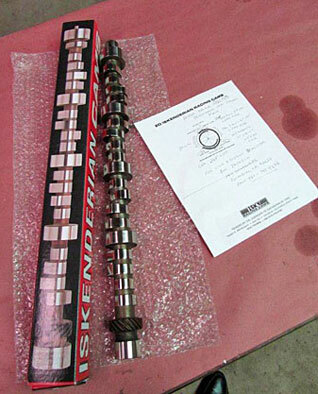 The engine builder, suggested the pair contact a cam grinder in LA for a camshaft. 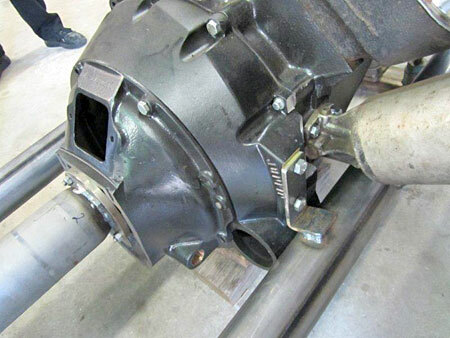 As it happened, the cam grinder had just stumbled across a cam design that added an overlap period to allow the engine to cool a little from fuel going right through the engine. He called it the Five Cycle cam. They got his first cam. 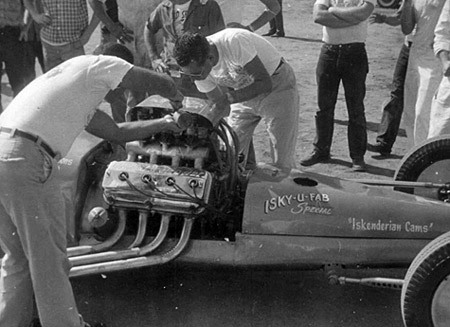 The first time out with the new engine was at Long Beach in early 1957 and the car ran better than any car had ever run, starting with speeds of high 150's and culminating in a speed over 166 mph. 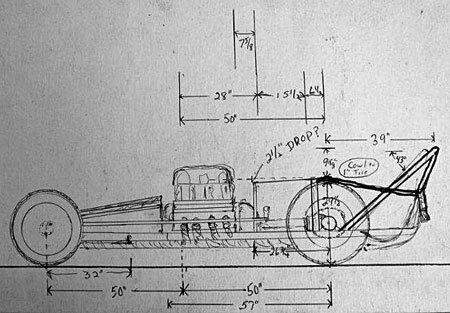 This was the fastest speed ever achieved in a quarter mile and completely debunked a popular theory that put a limit of about 160 mph by a wheel driven vehicle. There was a lot of attention created and some of it not so good. 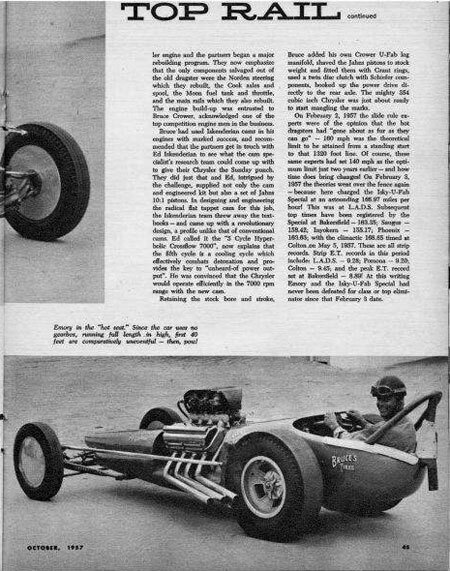 The promoter of the neighboring Santa Ana drag strip heard about the times and banned "fuel" (nitro or alcohol) from his track because he feared cars would go too fast in this pre-parachute age, to stop safely. 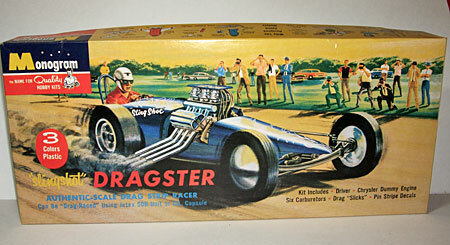 Many other tracks and eventually even NHRA followed with bans of their own. 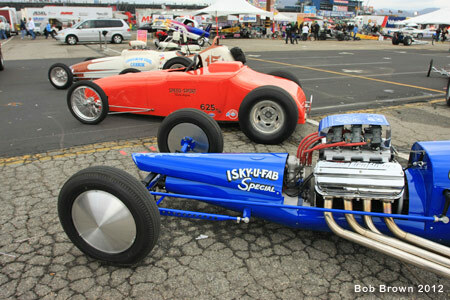 However, many other tracks, not in lock step with NHRA continued to run fuel cars. During the months following this event, the team, now famous, traveled to those nearby tracks that allowed Nitro and set top speed, and low e.t. records at most if not all and running up an almost unbroken string of top eliminator wins. Toward Fall, there would be two major non-California events. The ATAA World Series of Drag Racing in Cordova, IL and the AHRA Nationals at Great Bend, KS. running against the NHRA Nationals on Labor Day weekend. The San Diego pair decided to attend these races. 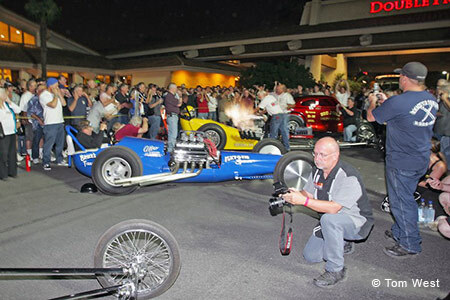 At the Cordova event, they were the odds on favorite to sweep the event, with the major competition coming from a rear-engine roadster from Tucson. 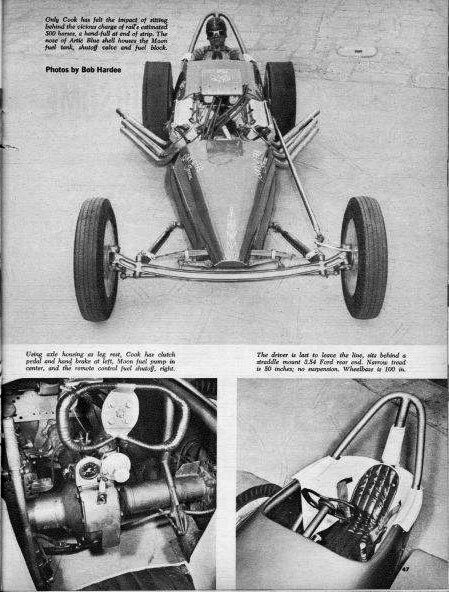 That car was basically a copy of the rear engine roadster that the San Diego amateur driver had driven a year or two earlier. There were a few other "fuel" burners there, a California flathead-powered car, a Chrysler car from Detroit and another from Tampa Florida. 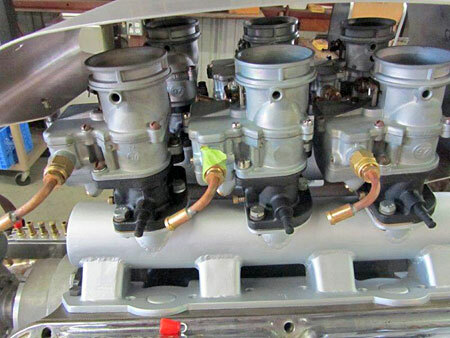 The San Diego team, in a move they would later regret, helped and advised the Florida car owner get his act together, to rework his fuel system to run upper percentages of Nitro instead of the low percentages he had been running. 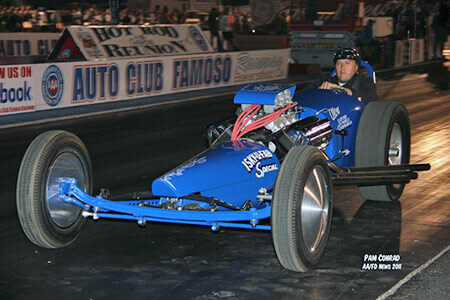 He went on the beat the San Diego duo for Top Eliminator, ultimately losing to the Detroit car. The following weekend the San Diego team went to Great Bend where they cleaned up on the field and returned home. While there, however, they were approached by a small group of Wichita racers who wanted to buy the car. The transaction took place a month or so later and the car went to the land of Oz. The San Diego team split up and the body shop owner never raced again. 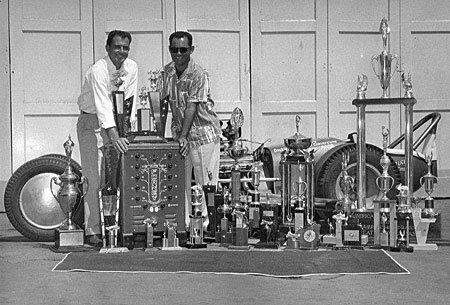 A career that lasted only a little over a year but set the drag racing world on its ear and changed the sport forever. 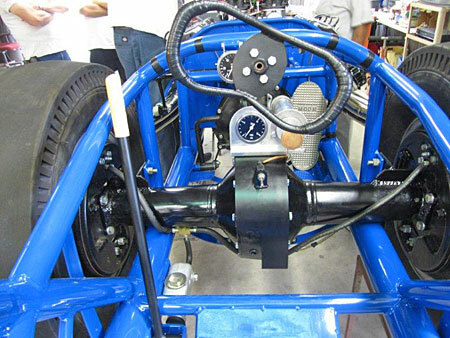 The amateur driver went on to drive for a variety of other owners and ended up in the late 1970's building a car similar to the car he and the body shop owner campaigned. It was never meant to be either a replica of the original nor an actual racing "contender" but simply an exercise in evolution for personal satisfaction. That car is now in a Florida Museum. But what about the original car, the one the Oklahoman brought to California? 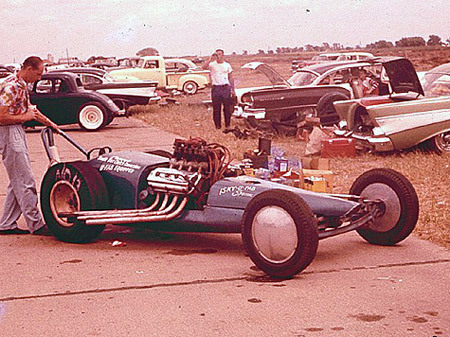 Well, once in Kansas, it was campaigned on a local basis for a brief period of time, often driven by one of the group, who would become arguably the most famous dragster body fabricators and race car craftsmen of all time. 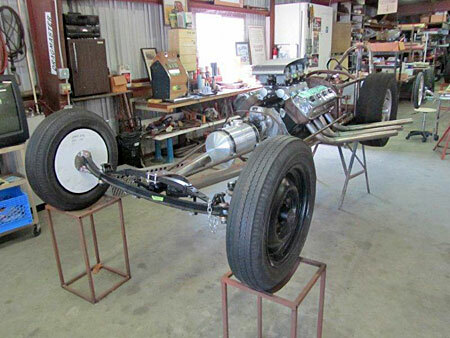 Eventually the car was replaced with a similar chassis and the original went onto the scrap heap. But the story doesn't quite end there. The original had been cut into three pieces and tossed. 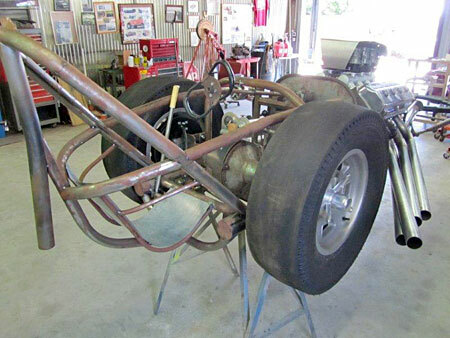 A local racer asked the guys if he bought it to put a flathead in, would they put it back together again. They agreed and the car changed hands again. This time it was raced for awhile and then sat for years unused and eventually was stolen out of a storage barn and lost to time. First, although many of you may have guessed at one or more of the names of those referred to in part one, I'll lend a hand for all of you. The chassis builder from Oklahoma is, of course, Scotty Fenn. The service manager was Lou Baney, the dealership, was Yeakel, the local lad was Kenny Arnold and the race was the AHRA race. The bodyshop owner who bought the car was Cliff Bedwell, the amateur driver, Emery Cook. The rear engine roadster was Cook and Henslee. 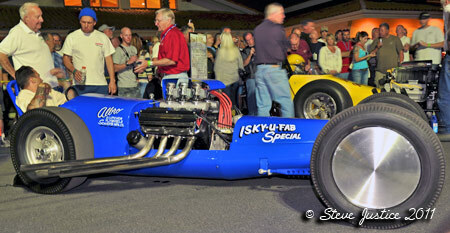 The Hot Roadster which the "Quints" put their engine in was owned by Ray Lake. 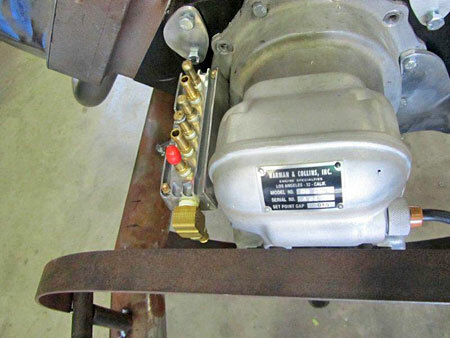 The brother in-law who loaned the engine was Joaquin Arnett The engine builder was Bruce Crower, the cam grinder is Ed Iskendarian. The track manager at Santa Ana was C.J. "Pappy" Hart. 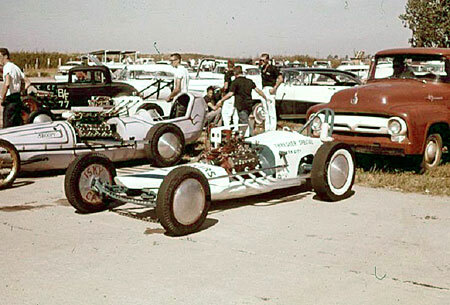 At Cordova, the rear engine roadster from Tucson was Speed Sport/Lords Car Club, also known as Fisher, Greth and Maynard. 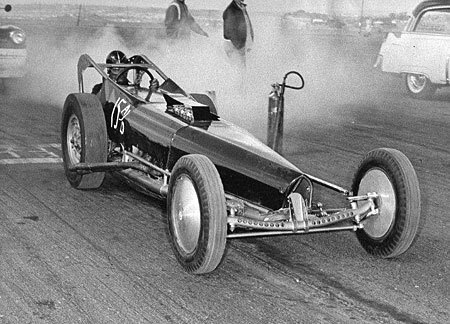 The Flathead dragster was Gene's Brake Shop driven by John Bradley, the winning car at Cordova was the Postoian Brothers from Detroit and the Florida car owner was um, ahhh, I forgot his name. Oh, could it have been Garlits? The driver of the car after it was sold to the guys from Wichita was Tom Hanna. Following up, this is the car after Jim Meyer, Tom Hanna's buddy, sold it. Hanna said a local Kansas guy bought it and put a flathead in it. 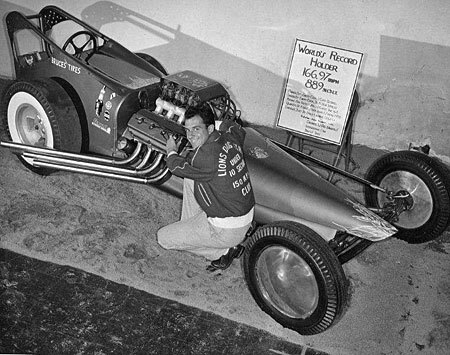 I got more interested in this car because about 4 years ago when Cliff Bedwells cousin, named Wes Fence, contacted me because he googled pictures of the car and Cliff at Cordova on my website, bigyohnsracing.com. 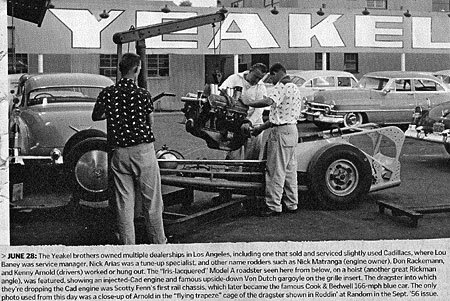 I was there in 1957 and watched and took pictures as Emery Cook helped Garlits get his tune-up, wrote a story on the race for our Car Club publication, the Gopher State Timer and posted story and pictures on bigyohnsracing.com. Wes sent me pictures of the car from Cliffs personal collection and I saved them, of course. Because it was a watershed car, in terms of performance and impact on the sport, I was always entranced with it and its history, so you could say it was a favorite of mine. 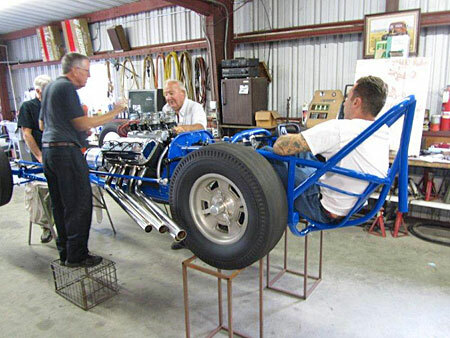 So, here we were at Coronado Naval Air Station in October 2011, Bill Pitts and I with our cacklecars on trailers, and Ray Lake, who has a hot rod Ford F-100 pickup and has been a push car for all of us at many events over the last few years. We were talking about Cackle cars and what cars needed to be built. I knew that Garlits had the more recent version of Emerys car, but the original was another matter. 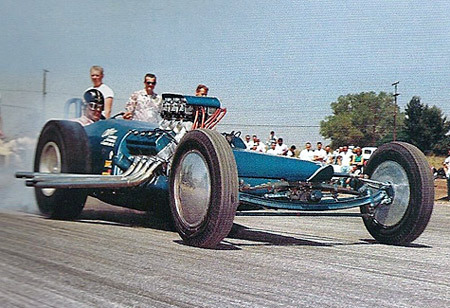 As we talked, Ray told us of having had Emery drive HIS roadster after the Cook and Henslee partnership broke up, and that Ray had traveled with Emery and Cliff to numerous events during that fabulous year, 1957. Ray had also been a member of the Car Club that ran Paradise Mesa dragstrip and had become good friends with both Emery and Cliff. I suggested that HE was the guy to build a recreation and told him about my communications with Bedwells nephew and that I knew that Bedwell had moved to New Zealand, but figured I could get ahold of him. Also, I knew Hanna, and Bruce Crower, and Ed Iskendarian and some of the other players in the story and offered to assist Ray with the build should he decide to do it. Within a week, he called and said he was up for the challenge. I called Hanna and started to get into communication with Cliff Bedwell and Ray and I started to figure out what he would need in the way of parts and components. Bruce Crower invited us to come and visit with him, which we did, and he agreed to assist as he was as able. 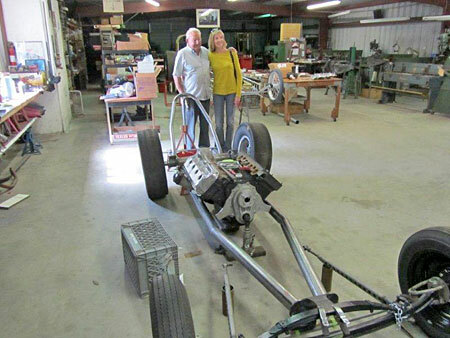 Hanna put me in contact with the actual purchaser of the car from Cliff Bedwell in 1957, Jim Meyer, and he said that as the last owner of it in it's full original iteration he had no problem with Ray recreating the car. I was able to talk to (by phone) and email with Cliff Bedwell and he sent a written statement approving Rays recreation of his car. 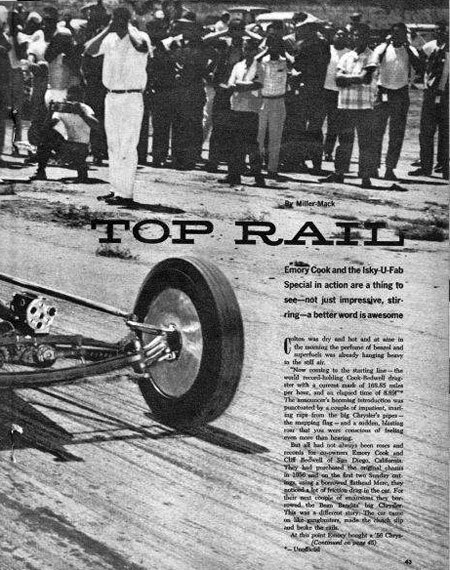 Remember, the car Garlits has was never Cliffs, it was a wholly separate venture of Emerys and no real connection to the original. So Ray and I started working on gathering parts. My time and his money!!! I talked to Iskendarian at the Mooneyes Xmas party in December at Irwindale race track and he agreed to make a Five Cycle cam for the project. Then I saw Dode Martin who was there with his just completed Dragliner. I asked Dode if he was up for a project. He was pretty dubious. But then I told him what the project was. His eyes lit up and after a hurried consultation with his assistants, he agreed to build the car. 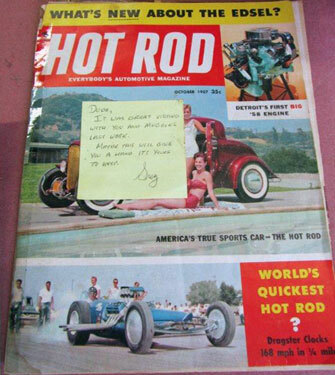 I had overstepped my bounds as consultant, because Ray was paying the bills, but when I called him and told him that Dode would build the car, he was virtually overcome with the all-star cast and quickly agreed. So, here we are. 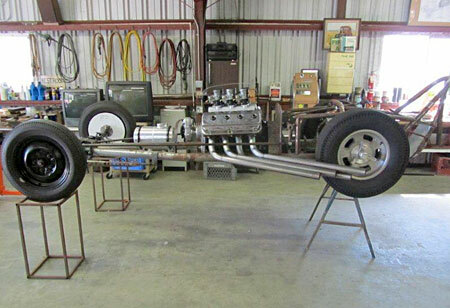 Dode took on the project and with assistance from a couple of local lads, will do the entire car, from chassis through powdercoating and painting. No chrome, no polishing, this is a RACE CAR! 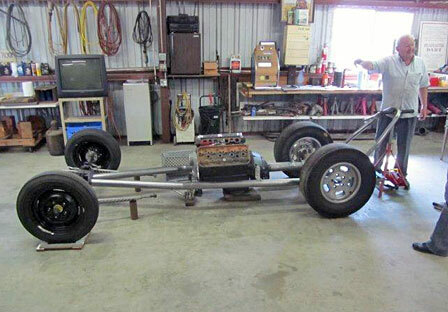 The car is expected to be finished for the CHRR. I am very happy for Ray and his wife Ginger, who has been a more than willing participant in the program. 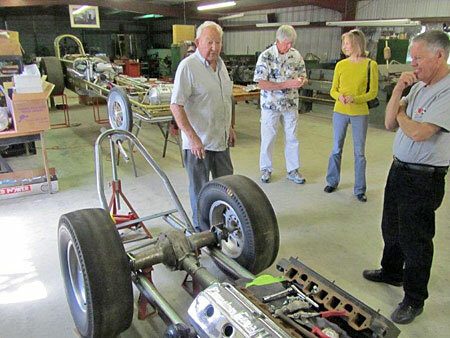 She is more than likely kind of puzzled about what can make a bunch of old guys get emotional looking at a pile of pipe and cast iron on the floor of a race car shop, but we have tried to explain to her about the significance of this particular car. I think she gets it. 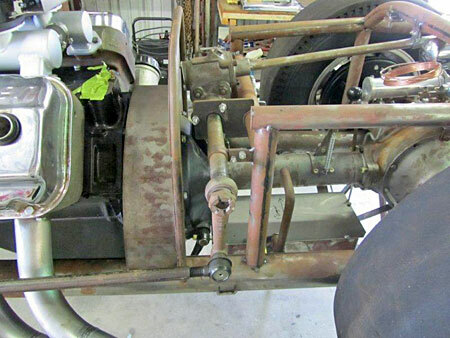 Ray and Dode have a long ways to go, but most of the hard to locate parts have been found and as I told Ray would happen, when people hear what he is doing they will pitch in and go above and beyond to help him make it happen. 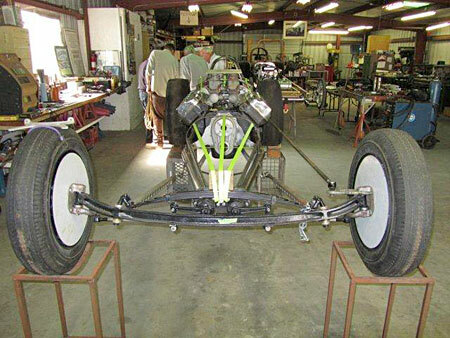 When I talked to Ed Iskendarian about the project and getting the cam and lifters, he thought it was pretty funny that "Dragmaster" Dode Martin was building a Chassis Research car! The irony has not been lost on us either. 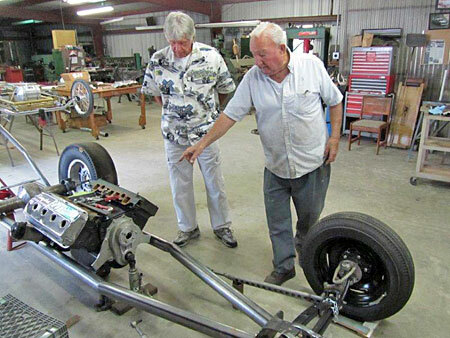 This is the first look Ray Lake, on the left, had at the car since Dode, on the right, picked the rails off the floor/chassis jig and set the front and rear ends and engine in place. Dode is holding onto a grand old tradition. He chalk marked the rail position on the floor and built it right there. 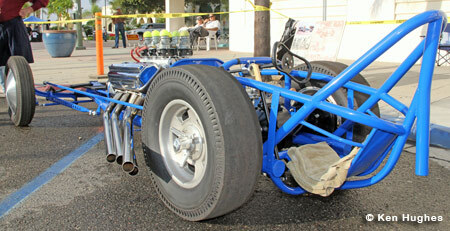 The finished car was first seen at the 2011 Escondido Nitro Night where it was on display. 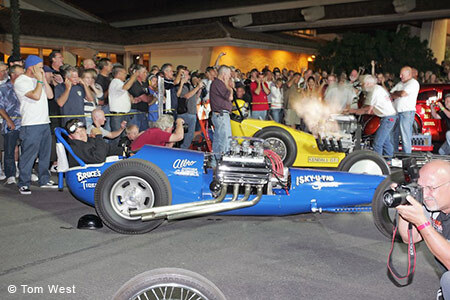 Its next outing was as a featured car at the Doubletree Hotel for the 2011 California Hot Rod Reunion. 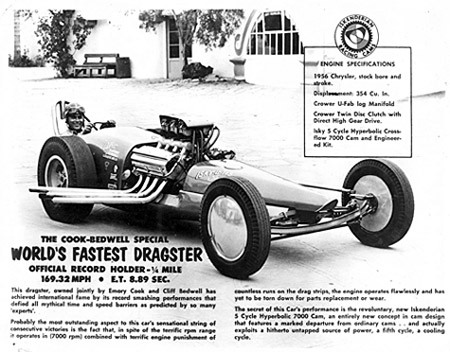 Ray Lake was in the Cook & Bedwell car. It took a few tries to light but once it did you couldn't miss the unique sound of nitro through carbs. 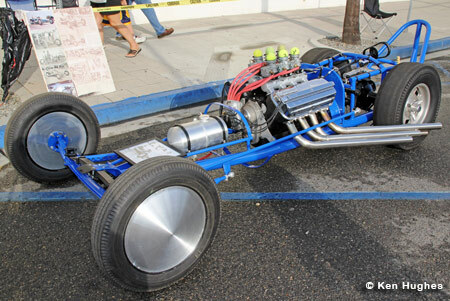 On display at the 2012 Grand National Roadster Show in Pomona. 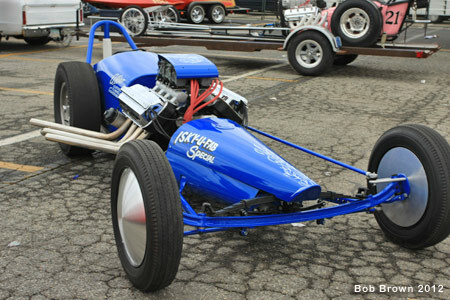 On display during the 2012 NHRA Winternationals at Pomona. &COPY; COPYRIGHT NOTICE 2005-2019 All Rights Reserved.